Premiered at the Sunset Magazine Idea House, the WaterFallSink offers geometric simplicity in a minimalist design. Water flows from the deck or wall-mount faucet to the top ramp and then gently onto the lower ramp and into drain. This design allows the insertion of a second color on the top ramp as an option (photo 3). Includes counter, integral sink, and 6″ high front and side aprons. Inner bowl measures 28″ wide x 12 1/2″ deep x 6″ high. Offered in your choice of 24 standard colors, P-Series molds are in stock and ready to pour upon color selection and faucet placement instructions. Custom sizes, colors, and optional stands and backsplashes are available – please call for details and pricing. NuCrete™ is a stain resistant concrete that is an eco-friendly building material – the result of a proprietary process starting with a specifically engineered concrete mix, a controlled placement, curing technique, and a chemically fortified and mechanically honed surface that preserves the very popular look and feel of concrete and natural stone. 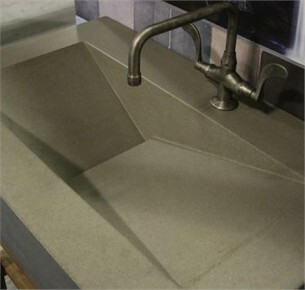 NuCrete™ is permanent chemical fortification of the stone that will remain stain resistant for the life of the product with very little maintenance. ©2019 Cast Sustainable Construction Inc.